Camp Bow Wow®, the largest and leading doggy day care and boarding franchise, recently ranked #1 in the Pet Services category in Entrepreneur magazine's Franchise 500®, the world's first, best and most comprehensive franchise ranking. 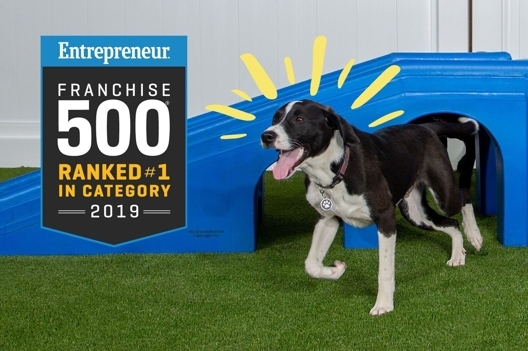 Known as an invaluable resource for potential franchisees, the Franchise 500 also recognized Camp Bow Wow as #193 among all franchises for its outstanding performance in areas including unit growth, financial strength and stability, and brand power. Placement in the Franchise 500 is a highly sought-after honor in the franchise industry, as evidenced by the fact that Entrepreneur received more than 1,000 applications this year, making it one of the company's most competitive rankings ever. "Ranking #1 for the fourth year in a row truly solidifies Camp Bow Wow's position as the leader in Pet Care franchising," said Camp Bow Wow President, Cail Morrison. "Day in and day out the franchise owners and employees at each location provide top-notch service to all Campers. Through their collaborative efforts with the corporate team, the brand truly lives up to its vision of 'Happy Healthy Pets, Happy Healthy People.' Receiving this noteworthy accolade at the on-set of 2019 is a great way to kick off the year." The key factors that go into the evaluation include costs and fees, size and growth, support, brand strength, and financial strength and stability. Each franchise is given a cumulative score based on an analysis of more than 150 data points, and the 500 franchises with the highest cumulative scores become the Franchise 500 in ranking order. "As we celebrate 40 years of producing the Franchise 500, it's a good opportunity to step back and look at how much has changed since that first ranking in 1980," says Jason Feifer, Editor in Chief of Entrepreneur. "While the franchise business model has changed little, the strongest franchise brands are constantly evolving and innovating to keep up with changing trends and technology." Over its 40 years in existence, the Franchise 500 has become both a dominant competitive measure for franchisors and a primary research tool for potential franchise owners. Camp Bow Wow's position on the ranking is a testament to its strength as a franchise opportunity. At the end of last year, Camp Bow Wow announced 2018 to be one of its strongest years of growth. The $100+ million-dollar brand more than doubled in year-over-year growth in openings by reaching its projected goal of 20 new locations. As the company continues to align itself with strategic franchisee partners who are interested in investing in the pet care business, the brand is on track to match or exceed 2018's Camp openings in 2019 and to reach its long-term goal of more than 300 units in the next three years. To view Camp Bow Wow in the full ranking, visit www.entrepreneur.com/franchise500. Results can also be seen in the January/February 2019 issue of Entrepreneur, available on newsstands.